Based on the 7 deadly sins, Devil’s Delight is a demonically themed 5 reel, 20 payline video slot from Net Entertainment. This brush with Old Nick comes with expanding wilds, a pick ’em style bonus game and a free spins feature where multipliers can reach 5x. Look out to for special Sin Spins which can be very lucrative. Dance with the devil from between 20p and £100 per spin. Despite the devilish theme, the imagery has a comic touch – look out for gravestones, skeleton hands, horned hearts, 666, bubbling cauldrons, imps and she-devils. 5 she-devils in a line will get you a scorching hot payout of some 4,000 coins. The cigar-chomping devil is the wild – appearing on the middle 3 reels only, it expands to fill the whole reel whenever it hits and forms part of a winning combination. Devil’s Delight comes with 3 bonus features. Land the Grim Reaper on reels 3, 4 and 5 and you’ll trigger the Bonus Game feature – once triggered, you have to match the deadly sin symbols – greed, gluttony, lust, sloth and wrath – with a character in a street scene. If the chosen character dies, you’ll win a prize and their soul is saved in the soul-o-meter below the reels. Prizes of up to 500 times your stake are on offer here. Saved souls are held for 48 hours. Once you’ve collected a total of 15 souls, you’ll trigger the Sin Spins feature – here you’ll receive 10 free spins which are played out on a special set of reels that features a reduced selection of symbols, all of which relate to the 7 deadly sins. The expanding wild is also in play here. The coins accumulated in collecting the Sin Spins determine the level of stakes you’ll play at. This feature can be a highly lucrative proposition. There’s also a standard Free Spins feature which is triggered by landing 3 or more of the pentagram symbol – you’ll then be awarded between 7 and 17 free spins with multipliers that can boost your payouts by up to 5x. Extra free spins can be won if you land 2 or more pentagrams. The other features can be triggered here too. As you’d expect given the devilish theme, the variance here is pretty hot – the volatility is in the high range with potential wins of over 7,000 times your stake! Expect some arid spells when you’ll seemingly set fire to your bankroll punctuated by some scorching hot runs. 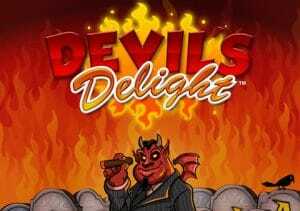 With NetEnt’s typically high end of mix of quality design and excellent features, Devil’s Delight certainly lives up to its name and is well worth a play. If you like the theme, Play ‘N Go’s Leprechaun goes to Hell and Microgaming’s Hellboy are recommended.